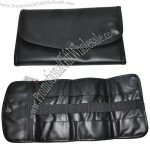 A black faux leather pouch that can be folded and secured with a magnetic button clasp. 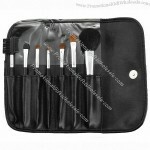 Case features an individual slot for each makeup brush and a protective flap that folds over the brushes for extra protection. When open, the case measures 22.5 x 17.5cm. 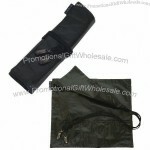 Black brush pouch provides several pockets to store long-handle brushes. 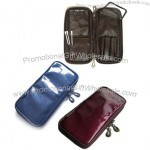 This brush pouch stores not only brushes, but various products, such as pencils. 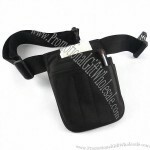 This pouch, is practical and can be conveniently used anywhere. 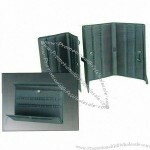 Leather pouch can be foled and secured with volcro close. 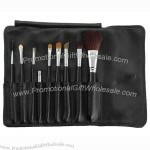 Total has 7 slots in different sizes for various kinds of brushes. length: App 21 cm/8.2" Width:App 19 cm/7.4"
Strap length: App 46cm/18" Strap width：App 1 cm/0.3"
Pendant diameter: App 3 cm/1.1"
This tool belt was developed especially for the needs of the makeup artist. It holds all the important tools of the trade such as makeup brushes, powder brushes, eyebrow pencils, scissors, combs, and more. The compact and efficient design includes a hidden inside pocket, business card case and adjustable belt for optimal comfort. Brushes and sponges are sold separately. 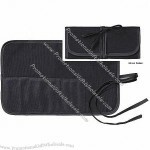 This black eco-Friendly brush pouch is perfect for holding nice of your favorite brushes. The pouch rolls up to a compact size and has ties to keep if from unfolding, making travel and storage easy. 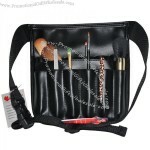 This useful pouch allows you to store your brushes and makeup. It includes his own mirror for last-minute touch-up. Its format is not only convenient but its finish is rich and luxurious. The Problem: Storing make-up brushes so they are kept clean and protected. Durable and easy-to-clean. 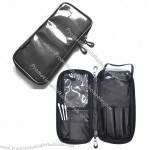 The Fold-Out Make-Up Pouch has internal pockets to hold all types of brushes and sponges. When you’re done, simply cover brushes with the protective flap, fold and store. Holds 12 brushes. 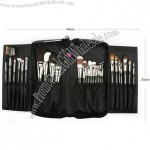 Case features an individual slot for each makeup brush and a protective flap that folds over the brushes for extra protection. When open, the case measures 22.5*17.5cm. 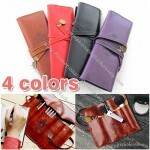 These wallets are for the professional artist, who likes to carry their collection with them. They are perfect for the landscape artist who likes to paint outdoors. 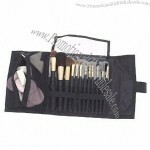 You can hold up various brushes pr pencils in different shapes and size. With the cardmaker and scrapbooker in mind, an added benefit is that these wallets can also be used for carrying pastel pencils, watersoluble colouring pencils & a range of artist quality felt tips. 1 pocket for a makeup sponge. The slots are large enought that you can double-up on the smaller brushes! 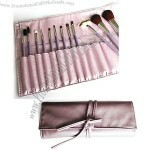 It also comes with a flap that will keep your brushes well protected and magnetic snaps to hold your case in place. Opened: 43.5 x 26cm. Closed: 13*26cm. 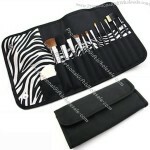 Keep your makeup brushes in top condition by storing them in this chic Black Makeup Brush Case. A must for the Makeup Artist PRO and the Traveler on the Go! Custom-made Brush Pouch From China Factory, Low price Brush Pouch, Top Quality, True wholesale source for original!